Having said that, there are a few tried and true High St stores that I rely on for good quality clothes at very affordable prices. One of which being Uniqlo. Often I'd splurge a little more on coats and jackets but I hesitate to spend more than £15 for a t-shirt. The winter months are long and can be pretty brutal. Nothing compared to the winters in parts of the US and northern Europe, of course. When I first arrived in the UK 3 years ago, I brought along my winter coats from Auckland. The winter months back home tend to be relatively mild. My new English friends told me that the winters are no different to New Zealand seeing that this is the South of England after all. Weeeelllll, on our first winter, it snowed. A. LOT. Followed by blizzard. All I had was a cotton blend trench coat. We were snowed in and every public transportation ground to a halt. Apparently, it was the worst winter in 20 years or something like that. The second year, it was far worse. Everyone was stunned. The entire country shut down thanks to a low stockpile of salt. It was all over the headlines where it was declared the worst winter in 100 years. By the time my third winter came along, we took off to New Zealand to enjoy a nice balmy summer. I also avoid looking like a Michelin man (or woman) by wearing a layer of Merino wool thermal tops from Icebreaker. My family and I have been wearing them for years. I support New Zealand products whenever I can. That said, the merino wool from New Zealand is amongst the best in the world. Okay, I'm biased. To date, I will buy ONLY New Zealand apples which thankfully, are readily available at Marks and Spencer. Ooops. Like I said I have the attention span of an insect. Sorry. I've compiled a list of winter coats, all of which have at least 50% wool content because I don't want anyone blaming me when they turn into an iceblock. Love those coats you compiled! They are so stylish and affordable! 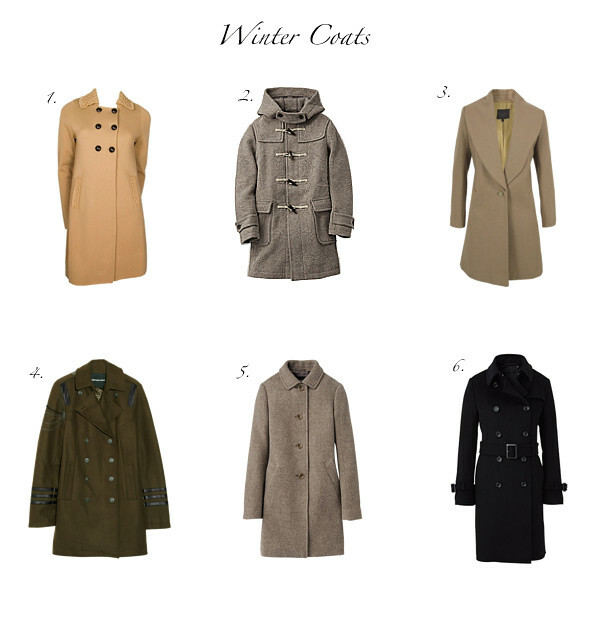 No2 the uniqlo duffle coat is my fav for winter, it is a classic design, and not too dressy or too casual. Perfect for everyday. Being in the South of Europe I must admit I'm blessed with warm weather, last New Years the temps were around 20c, I didn't even need a cardi out. I'm usually wearing a light cashmere beige coat from Loro Piana, but it doesn't cut it in Berlin or London... I don't even know what kind of frost bites I'd get in Boston in this light coat... So I have a Barbour parka for this kind of cold weather. I used to have a Martin Margiela black puffer coat, but it was too big on me (got it on a 70%off sale in Berlin) and now that I lost even more weight it is huge so I gave it away. Love your blog the way it is I don't think you have to change anything. It is always interesting in terms of subjects, and visually very pleasant! Love your choices! I need number 5 in my life!! i love 1, 5 & 6! your blog is better than online shopping bc you hv narrowed the items down to the really nice ones. it's so pleasurable to check in n see a new post. it's a blog tt takes me away to a dream world of beautiful clothes, yummy food, exotic travel...love it! and your photos...thank you thank you, keep blogging! maybe not 6. i used to wear a grey one just like tt. i felt like a detective. so , yeah, not 6. Momo, thank you for taking the time to post a comment. Much appreciated. Thankfully, our winters are pretty mild compared to what you get in Canada. I'd probably have to buy a jacket similar to yours if I ever get the urge to visit your country during the coldest months. Kat, glad you like the choices. I like a little structure to the coat. I've "liked" your blog so fingers crossed, I win your lovely necklace. StefPatt, glad you like the choices! Kim, thankfully, these days we can find pretty good quality clothes at very affordable prices. Bravoe Runway, can't wait to see what casual outfits you put together. BTW, I'm a huge fan of trench coats. Can't live without mine! Mona P, the Paul & Joe coat has such a retro feel to it. Lily, you've always say the nicest and most encouraging words. Thank you. Really REALLY appreciate the kind comments. All the best for your trip to Boston. Lauraloo, you must've communicated to me telepathically because no. 5 is my favorite too! Terri, whenever I feel drowned in the obstacles I face, I just have to read your encouraging comments. Thank you so very much. Black is the new black, thankfully, it's still pretty warm here but it doesn't surprise me when the cold snap returns suddenly. We have Uniqlo here..but their winter collection is not as extensive in UK (it seems that retailers think that ppl in tropics do not travel and if they do, they should don ugly winterwear that makes them fat). Anyway, anyone who bought winter coats oneline? How would you ensure that it looks good on you?